This is the second course in our junior development program. Each week students train with one of our Star Coaches for an hour of drama, dance and voice training. The course is designed to be extremely fun and stimulating, whilst ensuring students gain a solid technical foundation. As with all of our courses, coaches are rigorously trained to meet our high expectations and deliver a structured and fun development training. Each element of the class is more challenging than BabyStars. Dance: Students are given fun and exciting exercises to do. Dance style includes elements of Ballet, Jazz and Street and all exercises are developed using up-to-date technique. Our method is based on individual development and proper technique and our coaches are trained to make sure that every child is given the attention and care that they deserve. Our dance training builds rhythm, fitness, dance technique, good posture and good coordination. Voice: Students follow our fun exercises without realising that they are laying the foundations for safe and proper vocal technique. Students sing songs, work on rhythm, clarity of voice, projection, intonation, breathing, placement, resonance, pitch, timing and musicality. They also begin to learn songs from musicals and popular music. Drama: This section of the class includes fun theatre games. These games build confidence, team work, imagination, concentration, characterisation and creativity. Children love to play and take on characters and our training provides them with a safe and encouraging place to explore their creative side. The complexity of the exercises increases from BabyStars and the energy and pace is often increased to suit the age. 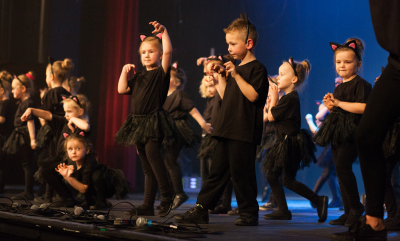 Children leave this course confident, with a solid foundation in dance and voice technique. They are ready to take on the next level at BuddingStars, where training is for 2 hours per week. This course is currently at two UK locations.